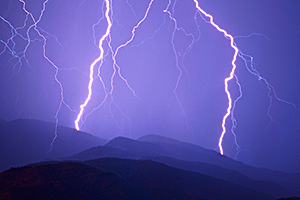 The conditions needed to produce lightning have been known for some time. However, exactly how lightning forms has never been verified so there is room for debate. Leading theories focus around separation of electric charge and generation of an electric field within a thunderstorm. Recent studies also indicate that ice, hail, and semi-frozen water drops known as graupel are essential to lightning development. Storms that fail to produce large quantities of ice usually fail to produce lightning. Meanwhile, downdrafts transport hail and ice from the frozen upper regions of the storm. When these collide, the water droplets freeze and release heat. This heat in turn keeps the surface of the hail and ice slightly warmer than their surrounding environment, and a "soft hail", or "graupel" forms. In the world of electricity, opposites attract and insulators inhibit. As positive and negative charges begin to separate within the cloud, an electric field is generated between its top and base. Further separation of these charges into pools of positive and negative regions results in a strengthening of the electric field. However, the atmosphere is a very good insulator that inhibits electric flow, so a TREMENDOUS amount of charge has to build up before lightning can occur. When that charge threshold is reached, the strength of the electric field overpowers the atmosphere's insulating properties, and lightning results. This positive charge will shadow the storm wherever it goes, and is responsible for cloud-to-ground lightning. However, the electric field within the storm is much stronger than the one between the storm base and the earth's surface, so most lightning (~75-80%) occurs within the storm cloud itself. A moving thunderstorm gathers another pool of positively charged particles along the ground that travel with the storm (image 1 below). A channel of negative charge, called a "stepped leader" will descend from the bottom of the storm toward the ground (image 2 below). This positive charge "reaches" out to the approaching negative charge with its own channel, called a "streamer" (image 3 below).